How can we tell what is toxic and what is not? How safe/green/environmentally friendly are ionic liquids? There are many ways of conducting toxicity studies. Usually the method of choice is based on how detailed information one needs, what facilities are available, and how much time one is able to invest. In our studies, we want to find fast and efficient ways of assessing the toxicity of different compounds, particularly ionic liquids. In addition, we want to know which features of ionic liquids affect the toxicity. We have used three different models in our toxicity assays (i.e. 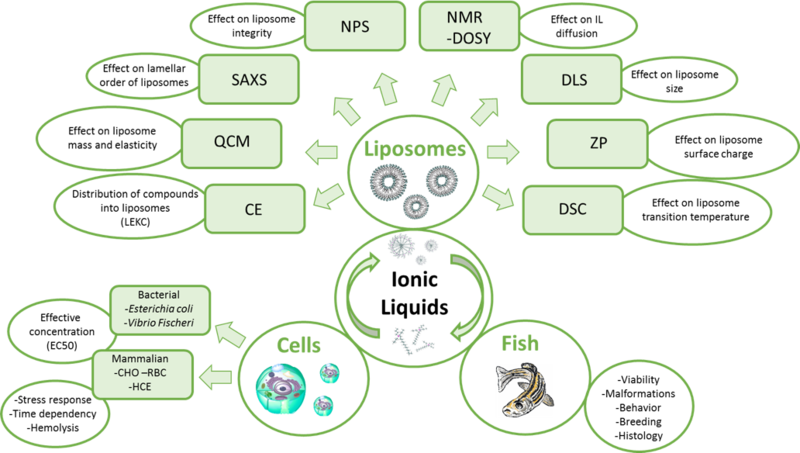 cells, zebrafish, and biomimicking liposomes), which all provide us with unique information. Using different cell lines (1), we can determine which concentration of the toxicant is lethal to 50% of the cell population (EC50 values) and how long it takes to reach the toxic effect. Even though the cell studies offer a valuable information about the toxic concentrations of ionic liquids we do not get information about the long-term impact. Therefore zebrafish embryos, young larvae, and fish (2) were selected as models for assessing the long-term impacts of biomass dissolving [DBNH][OAc] and [P4441][OAc]. In addition to the viability test we were able to prove that relevant concentrations of the above-mentioned ionic liquids did not cause any impact on the zebrafish malformation, breeding, swimming patterns, or histology. Another aspect of our studies is to develop a simple model for fast screening of the toxicity of newly synthesized ionic liquids without the need of any living organisms. 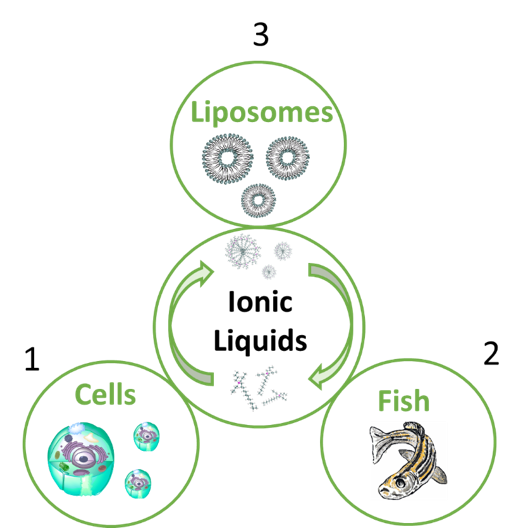 For this we utilize liposomes (3), which are biomimetic membranes, consisting of the same building blocks than most of the animal cells. There are many analytical methods we can use to obtain information about the interactions between ionic liquids and analyte (Figure 2). The use of these techniques together and/or separately offers us a way of gaining more information on what are the main features of the ionic liquids affecting the toxicity. Utilizing the information from all the three systems we have discovered that making the ionic liquid cation longer increases the toxicity more than if the anion is modified in the case of phosphonium based ionic liquids. The toxicity is also dependent on the aggregation of the ionic liquids and the toxicant exposure time, and this correlation depends on the structures of the ionic liquids. We have also noticed that most of the ionic liquids can be categorized into two groups based on their toxicity mechanism: cell-membrane-breaking ionic liquids and ionic liquids that affect the cell metabolism. The obtained information can be used now and in the future for designing safe and environmentally friendly ionic liquids. In addition, the analytical techniques offer a way for estimating the toxicity of surfactant-like ionic liquids in early preparation stages without the use of living organisms.